See that beautiful piece of machinery up there? 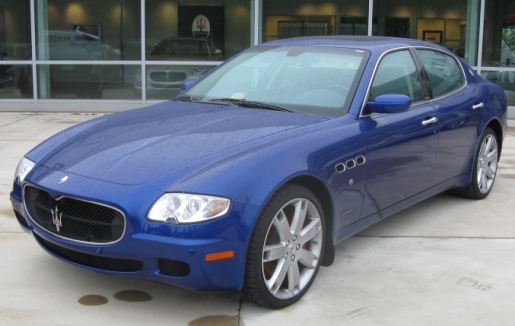 That’s a Maserati Quattroporte, one of the finest automobiles to ever come out of Italy’s sports car industry. Gorgeous, isn’t it? It’s very expensive, which means it’s not something someone on welfare should even be able to touch. However, a welfare cheat in Cerritos, California had a Maserati. The woman, 35-year-old Tangela Ridgeway, also had a house, a 2006 Nissan SUV, a business, and other unnamed vehicles, all the while drawing $60,000 in free money she didn’t need. Ms. Ridgeway is getting charged with 16 counts of welfare fraud and perjury, and she’s being held on $395,000 bond. If convicted, she faces 19 years in state prison. I say stick her in Folsom Prison and confiscate all her goodies. Nothing makes me sicker than welfare cheats or people who get it because they’re lazy.